Good evening, childer. Welcome to our old and blood-drenched soil. We have known the tread of the Hun, the Roman, the Magyar, yet we stand defiant as we always have. Now, after sunset, cries of war and horror pierce the night. As the old ways crumble and Usurpers receive their bloody baptism, limitless power awaits those clever and brutal enough to take it. 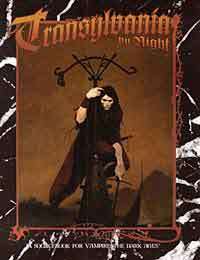 Transylvania by Night is a sourcebook that depicts the classic vampire country of Eastern Europe, as it is in the Dark Medieval world. One part history, one part Hammer Horror, this book will delight Vampire aficionados and genre fans alike.